What is Shaken Baby Impact Syndrome (SBIS)? SBIS previously referred to as "Shaken Baby Syndrome" (SBS) is an injury to the brain resulting from intentional head trauma which can occur when a baby is thrown, jogged, jerked, or shaken. Babies, especially very young ones, have relatively large heads, and weak neck muscles, so any kind of violent movement will cause a kind of whiplash effect. A baby’s delicate, developing brain is much more sensitive to injury and serious damage than an adult’s. Due to their small size babies under four months of age and those born prematurely are at particular risk of SBS. Head trauma from SBIS is a leading cause of infant mortality in Canada and the United States. Around 25 percent of SBIS cases die from their injuries. It is considered a form of child abuse. In SBIS, fragile blood vessels tear when the baby’s brain shifts quickly inside the skull. The build-up of blood in the small space puts pressure on the brain and eyes. Sometimes rough movements can also detach the retina (the light-sensitive back of the eye), leading to blindness. Signs of SBIS include tiredness, irritability, and breathing problems (although there may not be any obvious symptoms right away). In very serious cases loss of consciousness, blindness, motor deficits, learning disabilities, and other serious consequences including death may follow. SBIS commonly occurs in stressful situations when infants cry and are inconsolable. 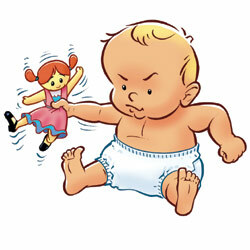 When nothing seems to soothe the infant, a tired, frustrated caregiver may handle the baby too roughly. How can SBIS be prevented? Babies cannot communicate any other way but by crying. When your baby cries but does not respond to being picked up or nursed, something else could be wrong. Above all, babies must be handled gently, and never shaken. Spin with the baby in your arms. Make sure that anyone else who handles your baby knows how to do so carefully. If the crying wears you out or you find yourself stressed to your limit take a time out. Separate yourself from your baby for a little while. If possible, ask someone else to take over comforting your baby. Put your baby in a crib or another safe place, leave the room and shut the door. Try calling a friend or doing something you find relaxing such as making a cup of coffee or tea, taking a shower, listening to music, reading or sitting down and closing your eyes. Don’t be afraid or ashamed to call for help. Talking to a trusted friend or relative can be enormously comforting as well. To learn more and to print the complete Please! Don't Shake Your Baby brochure (pdf), click here .